By Chris Williams on February 16, 2015. You know I was just thinking that it’s about the right time of year to write about winter wasps, and then your question appeared. What you’re dealing with is definitely disconcerting, but it’s not unusual to have wasps (they’re not bees) in a home during frigid weather outside. This might not make you feel better, but the wasps have been in your home since last fall. It’s almost certainly paper wasps that you’re dealing with. They’re one of the pests that we call “fall invaders” because they move into homes and other buildings in fall as they weather gets cooler and days get shorter. The wasps in your home are kind of special because these are the Queens whose purpose is to start new nests in the spring. When a paper wasp colony begins to decline at the end of the summer, the nest produces wasps that are destined to survive the winter while the other worker wasps will die at the end of the season. These Queens leave the nest and look for protected places to spend the winter. They often end up in attics and in other hidden areas around your home, especially if their nest was in or on your home (see Paper Wasps Inside in Spring?). For the most part, overwintering wasps remain hidden and quiet, but in late winter/early spring they can become active on warmer, sunny days. The Queens get confused and think it’s time to find their way back outside to start that new nest. They’re usually sort of slow and sleepy when they wake up and are not likely to sting (see Overwintering Insects Are Waking Up Inside Your House!). Unfortunately, one was apparently bumbling around in your bed, you probably rolled onto it, and it reacted defensively with a sting…a one time occurrence. What Can You Do About Wasps Indoors in Winter? There is not a good control method for these wasps because they could be hiding anywhere inside walls or ceilings and are practically impossible to track down (but don’t worry, they’re not in your box spring). If there was a large nest in your attic last year and many wasps are found spending the winter there, a pesticide space spray could be used to treat that attic space. In most cases though, it’s just a few random wasps and the control of choice is a vacuum cleaner. Console yourself with the thought that the wasps are not nesting inside your house. They will leave given the chance. 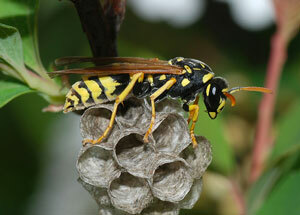 However, it may be a sign that you will have more paper wasps building nests on or near your house come spring. That’s one thing that we can remedy. Give Colonial Pest a call in early spring when you first see nest building (see Now is the Time to Block Wasps From Building Nests). We can keep that from happening. Our technicians can also apply an exterior perimeter treatment around your home in late summer that will prevent overwintering Queens from getting inside in the fall. Doing some pest-proofing to seal up openings on the outside of your home will help keep them out, too (see Keep Fall Invaders Out!). Give us a call!